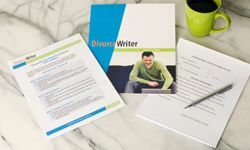 DivorceWriter provides you with everything you need to complete your own South Carolina uncontested divorce without an attorney. If both parties have lived in South Carolina for three months before filing for divorce, you can file for divorce. If only one party lives in South Carolina, that person must have lived in South Carolina for one year before filing for divorce. The spouses must have lived separate and apart without cohabitation for one full year before filing for divorce. This is the no-fault ground in South Carolina. Review and sign your documents. The judge finalizes your divorce by signing your Final Order of Divorce. You have qualified to use DivorceWriter to complete your South Carolina divorce papers online. Select "Continue" to start the interview.